The Warrington Swivel Bar Stool from Hillsdale Furniture features an eminent look that carries many traditional traits and characteristics. The oval back with molded edges, open arms and scrolled handholds recall Renaissance Revival armchairs from the middle 1800's that emphasized classic French Louis XVI style. 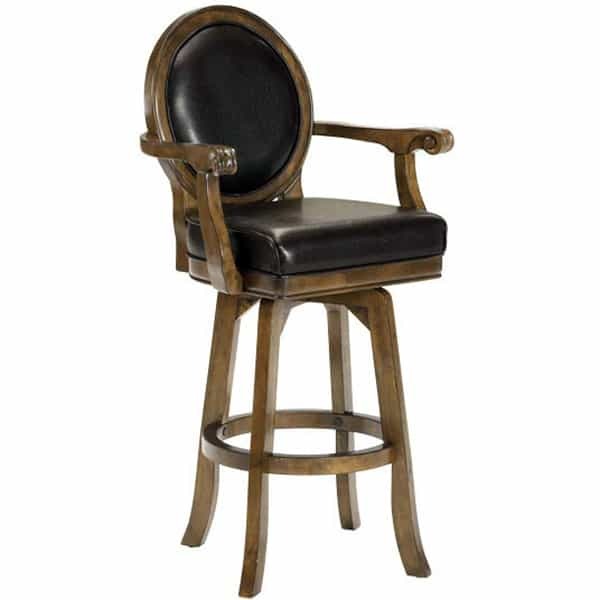 A design like this is typically found in antique parlor furniture such as armchairs and settees, yet this is a modern bar stool, with a 30" seat height appropriate for placement at your kitchen's bar. But the classic style and comfort that comes with the upper half of the Warrington makes it a perfect spectator stool paired with a partner stool, or placed alone, in your game room overlooking a pool table. W 25.75" x D 22" x H 47" SEAT HEIGHT 30"
This item ships via UPS / FedEx or by using a freight deliver service with a semi-truck; method used depends on size of the order. Most delivery times within the Continental U.S for in-stock bar stools range from two to five business days depending on location. All bar stool orders ship direct from Hillsdale or Family Leisure (in-stock orders) and usually ship within 48 hours from the time of purchase. Shipping Details & Conditions.